RE: Incomplete tutorial for the "ons-page"
Incomplete tutorial for the "ons-page"
"In this example we are using ons.ready(fn) which waits until the page is completely loaded before executing a callback function." Hello, it is possible to save the choices made during the customization of http://components.onsen.io/ so that the further update of, for example, a single component does not require to reenter the parameters for all the other unchanged components? What I am thinking is, for example, a config file that is downloaded the first time the theme is created and that can be uploaded each time there is the need to do further changes . If not presently possible, it will be, according to my opinion, a very useful feature to add. I tryed the disable-auto-styling attribute and it works fine. I suggest to add what @Fran-Diox stated i.e. 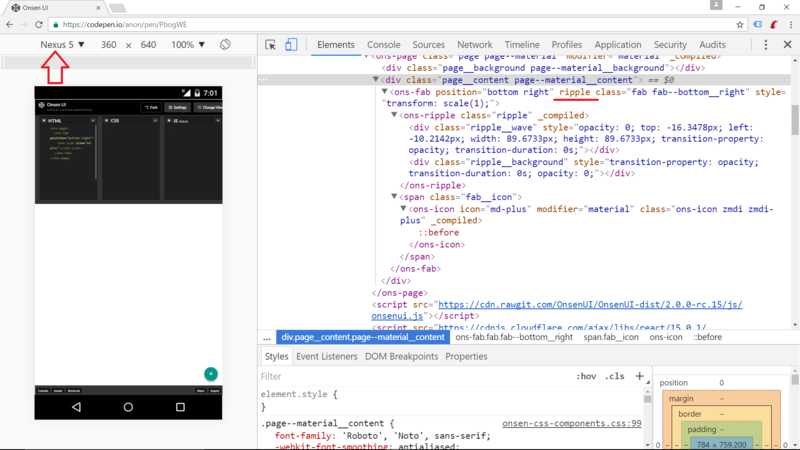 “Autostyling is automatically adding ripple effect to ons-fab and ons-button for Material Design”. Thanks again for the promt answer. As you can see, the “ripple” attribute is not specified. 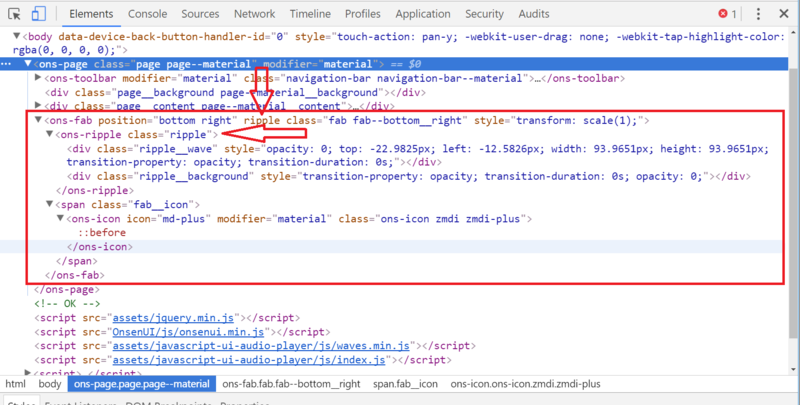 Nevertheless the ripple effect is present as shown in the attached Chrome dev tool screenshot. Any idea “who” is inserting the “ripple” attribute and how it is possible to remove it? Thanks for the answer. As hiding bars on scroll is almost a common behavior in the today apps, do you plan to include this feature in a future Onsen release? Can somebody please explain which is the reason to have three files instead of one and three different names? Hi, is there a way to automatically hide bars (tab bar and / or toolbar) when scrolling a page down? I didn’t find any mention in the Onsen documentation.